The program International Office Search supports you in looking for and finding auditors and tax consultants as cooperative partners for your international activities. Use the database for free and add your own firm to it! 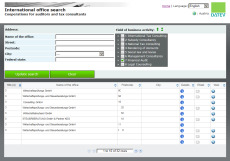 'International Office Search' is a database with facts and contact information about auditors and tax consultants from the entire European continent interested in cooperating with consultancies from various countries. It is also a powerful search engine where auditors and tax consultants can be identified and approached by new potential customers. 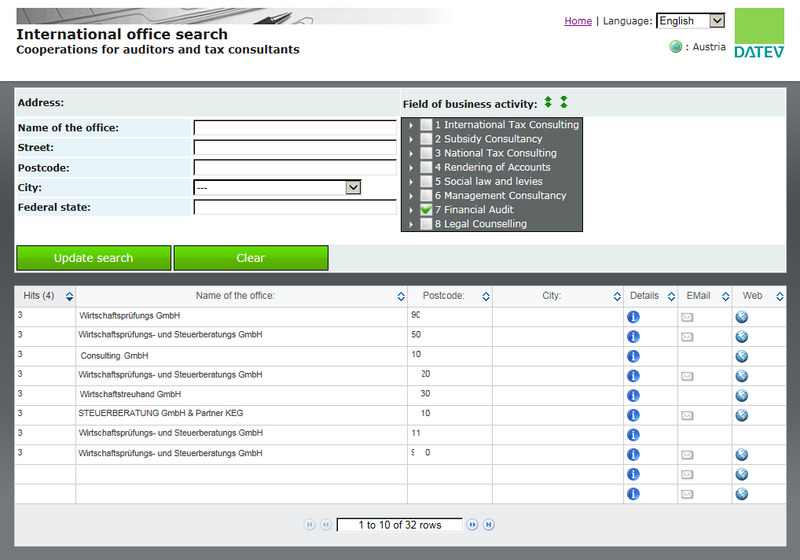 'International Office Search' is a comprehensive and user-friendly database which is constantly expanding and may be accessed through a secure Internet connection. The database contains international online fill-in forms, which are available for all countries in all languages where consultants' profile information and details can be submitted. Topical searches aggregate information into highly segmented indexes, helping users to refine their searches and quickly access the most pertinent and useful profiles. Search results are available according to target countries, regions, cities, national languages, categories and business activities. The resulting report displays a list with all detailed profiles and homepage links matching the requested criteria. Registration and usage of the database are free. For more information, please use the button "Contact us."